It is hard to envision what the Garden of Eden was like before the fall of man. Can you imagine an existence on this earth where there are no laws to break except one, and no conscience to violate, but only love and acceptance? 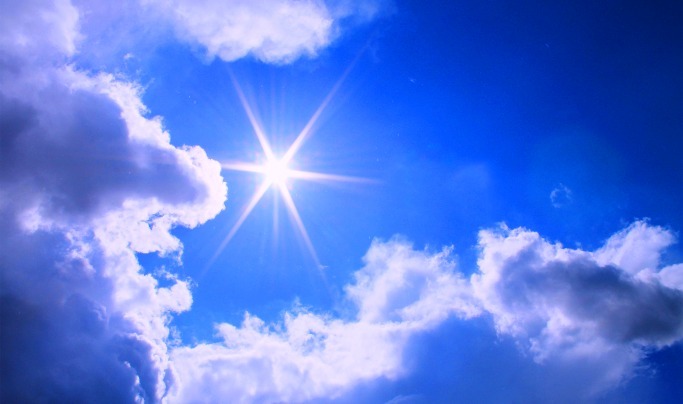 Man dwelt there with his Creator in love and all his livelihood was provided for him with no fear of death or sickness. There were no animals or men to fear, and no weeds or briars to fight. It was a place where there was total peace and fellowship with all God’s creatures. Even the animals communicated with man in love, using a common language that was heard from heart to heart instead of head to head. This is the world that God made for man to enjoy. Adam and Eve ran around like little naked kids with no sense of shame whatsoever and felt such love and intimacy together that their relationship was only driven by God’s agape love for and in them, not by self-centered lust. God was loving and communing with them as their Daddy. God so loved the world that He actually sent His own Son into this vile and dangerous place to restore man. Jesus not only consented to come here to the earth, but to be rejected, falsely accused by His own people and then tortured and killed in the most gruesome way possible, hanging on a cross. He did this so He could blot out the offence of our transgressions once and for all by taking our sin on Himself so we might be justified. The Hebrew word translated “restore” in the Old Testament is shub (shoob) and is found 1339 times in that ancient text. One of the most familiar verses is in David’s prayer, “Restore unto me the joy of thy salvation; and uphold me [with thy] free spirit.” Restoration of mankind is high on God’s list of priorities. The drawing above in my mind pictures what God has been showing many of us in one form or another as He calls us out of ourselves and into Him as His sons and daughters. The tangle of weeds and briars along the bottom represents the curse that man has been under for thousands of years. A concern over good and evil is an endless tangle and a trap that pitches one man against another through sin and the rigidity of laws and regulations. 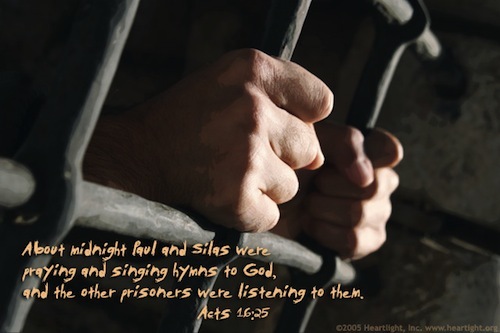 Much of Christianity is trapped there today. The first fruit of this wrong tree was Adam and Eve seeing their God-given state of nakedness as evil and making garments of fig leaves to cover themselves and hide from God. It is interesting that God said to them, “Who told you that you were naked?” It was the serpent who filled them with guilt and shame as they submitted to him in order to become wise. On that day they lost their child-like faith and trust in God. But God had a plan to pull us up out of the muck and mire of sin, law and death through the death and resurrection of His Son, the spotless Lamb Who takes away the sins of the world. We all know His plan to bring about the salvation (the saving) of man by Christ’s death on the cross, but there is so much more to it than just getting us out of the miry clay and setting our feet on the Rock. God has wanted an intimate, loving relationship with man from the beginning. He identified Himself as a husband to both Jews and Gentiles in both the Old and New Testaments. And finally in the New Testament, Jesus is identified as the Bridegroom and those who truly love Him as His Bride. This brings up the subject of intimacy. 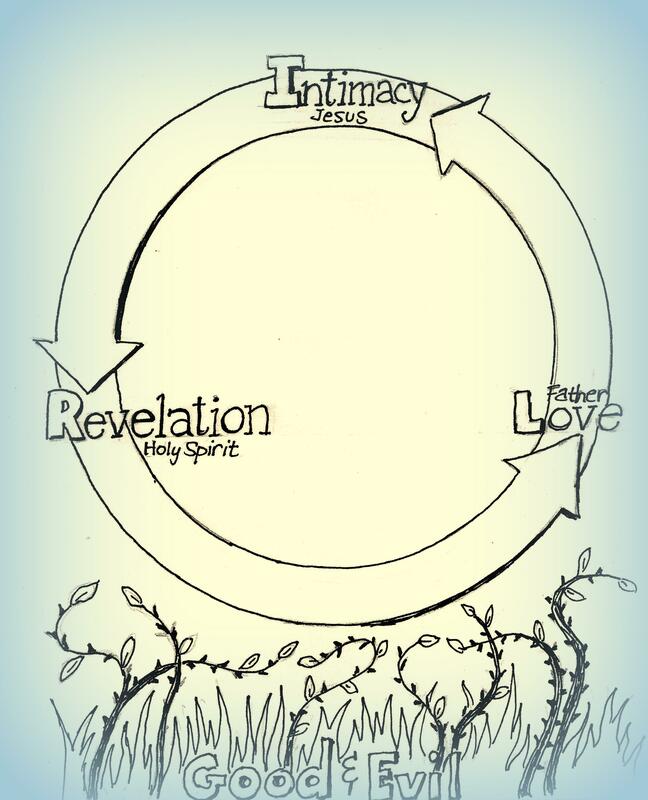 As depicted in the drawing above, Revelation, Love and Intimacy flow between and out from the Father, Son and Spirit. In this relationship, the Spirit reaches down into our lives with what the scriptures and is called the Spirit of wisdom and revelation in the knowledge of Christ. Jesus said that He would send the Spirit to us to lead us into all truth. With this revelation from Him we realized that God loves us and we in turn love God because He first loved us. We come into a relationship with Christ because He calls us and reveals Himself in us. We are also called into the intimacy of the Father and the Son, and from this intimacy comes and ever growing revelation of who They are. With this growing revelation grows an ever greater love for Them in us as well. We are caught up into this circle of love with them as well. You might say that we are being sucked-up into this tornado of love where the Father, the Son and the Spirit live for us because they love us so much. The closer we are drawn to Them, the more we become like Them and the more the world rejects us because we are no longer of this world. Soon, His love is so strong for and in us that we gladly loose ourselves from our earthly moorings like houses torn from their foundations in a tornado, and are totally caught up into the love of the Father and the Son. All the things of this world that were once near and dear to us lose their grip on our hearts. In my own case I used to live to fish and hunt and have a place of my own in the country that made it easier to do so. I even built my own hunting lodge that was on 20 acres of forest near lakes and mountains, but before I was done, God’s love so changed me that it was all I could do to finish this lodge so we could sell it and move into town where Father wanted me. How else can we as His bride ever become one unless we have a common depth of love for Jesus and the Father? Soon we become so enraptured with Christ and the Father that we are in total identification and unity with them and with one another in this same love. This is the goal of the gospel! So it is with the called and chosen. He loves everyone the same, but not all are able to receive everything He wants to share with them. John was not afraid to lay his head on Jesus’ breast because he was connected to Jesus by His great love. Of the twelve, only John was there with Him while He died on the cross. The depth of love for Jesus and the ability to cast off our worldly and religious expectations and be caught up in Him alone will eventually make the difference for all of us. At the last supper, before Jesus was taken captive by His murders, He prayed a very important prayer with His disciples. Here we see a prayer for revelation, love and intimacy… ONE. I cannot get away from this phrase, “that they may be one, even as we are one: I in them, and you in me, that they may be made perfect in one.” His desire was and is not only for us to join in their unity and love, but for us to know it among ourselves as His people! This vortex of love between the Father, Son and Spirit draws us up into intimate fellowship with Them. This precious promise is not in future tense, but in the present. Dear saints, let these words sink into the depths of your heart, for here is the reality of His revelation and love for us in the greatest intimacy imaginable. May we all come to know this intimacy and love as we abide IN Them. Amen. We Are Saved by His Grace! Who caused Paul to be born? GOD! Who called Paul by His grace? GOD! Who revealed His Son IN (not to) Paul? GOD! Who chose Paul’s calling? GOD! “While we were yet sinners, Christ died for us,” and while we are yet sinners God moves on us with His breath of Life and gives us the life of Christ. It is by His empowering grace that we believe and totally trust in Jesus to be Christ in us. 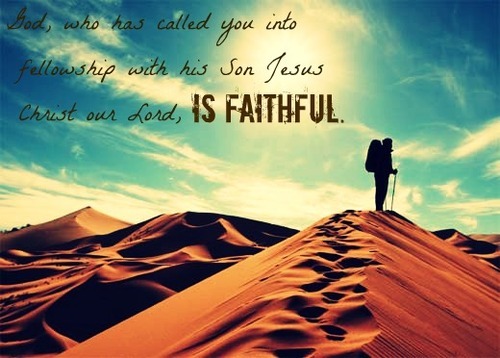 We trust in Him alone to do those works that Father has ordained from the foundation of the world for us to walk in. Through the Spirit who abides in us we wait! We don’t run out and try to earn our salvation or keep ourselves saved by doing good works. As we wait upon and have confidence in Christ in whom we live, He moves on us and in us with His love. From that love, the works we are to do become evident, and are empowered by His grace. We are birthed by the Father in Christ, and because of this, “in Him we live and move and have our being…for we are His offspring” (See Acts 17:28). It is His grace moving upon us, His faith within us we rest in, His love that moves us to act and His Spirit that empowers us—and never are any of these things of ourselves, but only are they ours as we abide IN and have put on Christ. What a great salvation our Father in His love for us has given us, that we should be called the children of God (See 1 John 3:1). Amen.